Michonne ~ "We're a hundred miles away. What if it is some place where we can be safe? It's a chance. Instead of just being out here, instead of justmaking it". 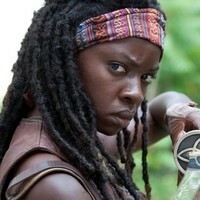 Not much is known about Michonne prior to the outbreak due in part to her keeping details of her life secret. It is shown that even Andrea knows very little about Michonne's past, as detailed in the episode "Walk With Me". Andrea confronts Michonne about how little she knows about her to which Michonne retorts, "you know enough". She also at some point started dating her boyfriend who died in the outbreak. In the mid season premiere of Season 4 Michonne dreams about her life prior to the outbreak. She had a son and a boyfriend. She wakes up screaming when she sees them having severed arms. From the dream, it can be assumed that Michonne along with Mike and Terry were art enthusiasts, as all three were debating an art exhibit they saw. 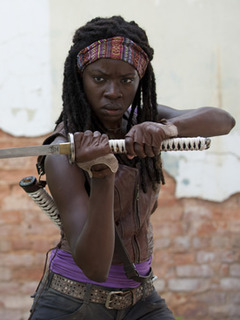 Michonne tends to work alone and quietly and keeps much of her past secret, even towards Andrea, but still fights for the survivors defense as strongly as the other active defenders. Michonne said that she "trusts her gut" when it comes to other survivors. After the loss of her boyfriend, she suffered from hallucinations in which she would talk to him. It was revealed that she likes art and/or sculptures as she looted a cat sculpture and claimed that was "too damn gorgeous" to leave behind. 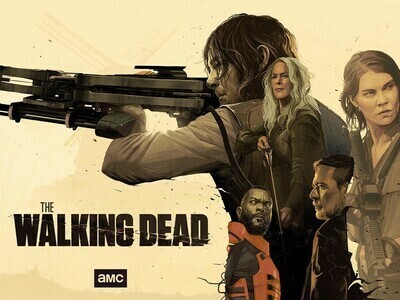 As time goes on she regains her emotions as she interacts more mostly with Rick and Carl and becomes more caring and now is accepted as a member by the whole group. Michonne appeared to have an aversion to babies, as she vehemently refused to hold Judith until Beth forced her to, and, while looking at Judith, shed tears, before hugging Judith close. Michonne later establishes that this is a manifestation of the guilt she feels for losing her own son, Andre.